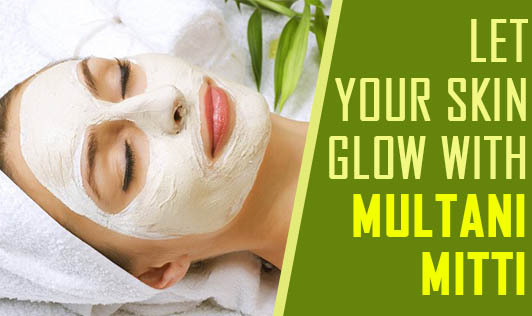 Let Your Skin Glow with Multani Mitti! Multani mitti also called Fuller's Earth in English is known for its beauty treatments since many centuries. Unlike other beauty products, it can be used for any skin type and generally has no side effects! It is inexpensive and easily available. When used regularly, it can treat acne, pimples, dark spots, pigmentation and also remove tan. Did you know that Fuller's earth can be used for hair packs as well? • For cleansing, blend multani mitti with rose water and make it into a fine paste. Apply it on the face and neck. Allow it to dry, and then wash it with plain water. This pack cleanses and brightens your skin on regular use. This pack is highly recommended for oily skin. • For glowing skin, blend two teaspoons of fuller's earth with 1 teaspoon of honey and a teaspoon of mashed papaya. Apply the mixture on the face and neck .Wash it with plain water after fifteen minutes for glowing skin. • A combination of fuller's earth, tomato juice and a teaspoon of sandal wood powder make an excellent combination for dark patches and black spots. • Make a thick paste using two spoons of multani mitti, one spoon of neem paste, half spoon of ground clove powder, a pinch of camphor and rosewater. Apply this pack on acne affected area. It helps in removing pimples and ugly marks. • Soak fuller's earth in water for two hours. Apply this on to your hair and scalp. Rub this mask on your hair like shampoo for 3-5minutes and rinse it with plain water. It removes excess oil and dirt from your hair, leaving it clean and shiny. • Massage your hair with olive oil and leave it over night. The next morning, wash your hair with multani mitti and milk. If you have oily hair, then use butter milk instead of milk. For the second wash, use a mild shampoo. Apart from conditioning and cleansing your hair, this application treats split ends effectively. Fuller's earth is an effective ingredient for skin and hair care. Do not forget to use it regularly in your beauty routine!